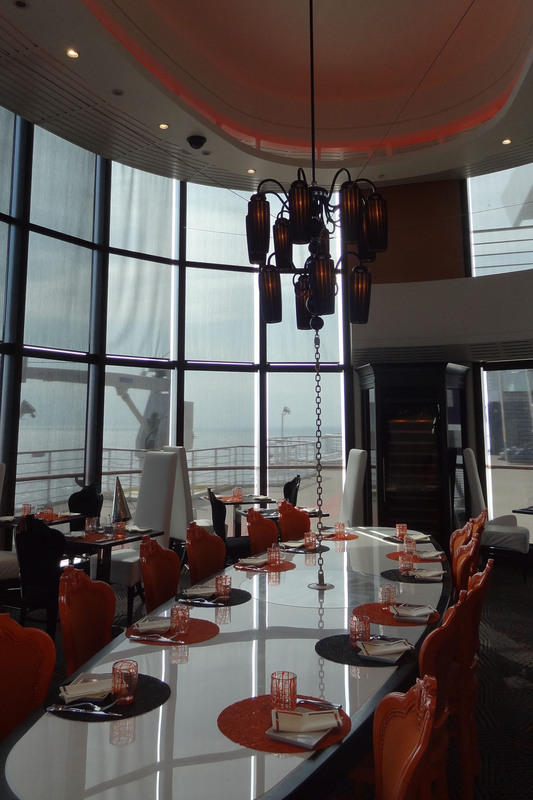 Come into Qusine aboard the Celebrity cruise ship Summit with us. It would be hard to imagine traveling without considering the pleasures of dining on the road. For us, travel means time away from our own kitchen and dining room, and invites us to sample more than just the sights and the sounds – we can taste our travels as well. And when you seek information about dining while away, you usually think about finding restaurant reviews in the cities and countryside where you‘ll be traveling. We’ve had many memorable experiences in wonderful city restaurants as well as some in more off-the-beaten track locales, but one of the most memorable dining experiences we had recently was on board a cruise ship. 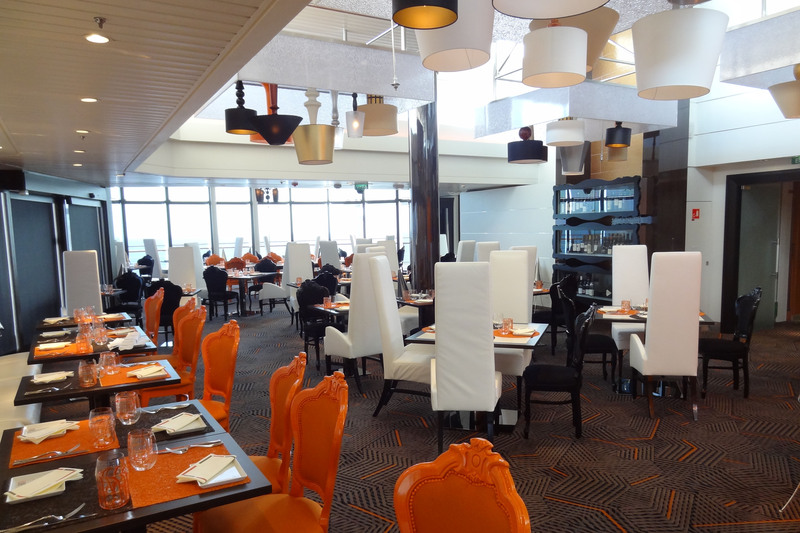 The fun begins with the innovative decor in orange, black & white. See those light fixtures? As difficult as it may be for some of the more jaded among us to comprehend, cruise ships today are truly entering the competition for dining experiences. Of course we’re not talking about the main dining room where hordes of wait staff flutter about taking hundreds of orders and serving mountains of meals all within an hour and a half time frame – although that experience does have its merits. We’re talking about the continuing move in the cruise industry toward offering more and more inventive ways to entice you away from that main dining room for an experience that you might not be able to have anywhere else. 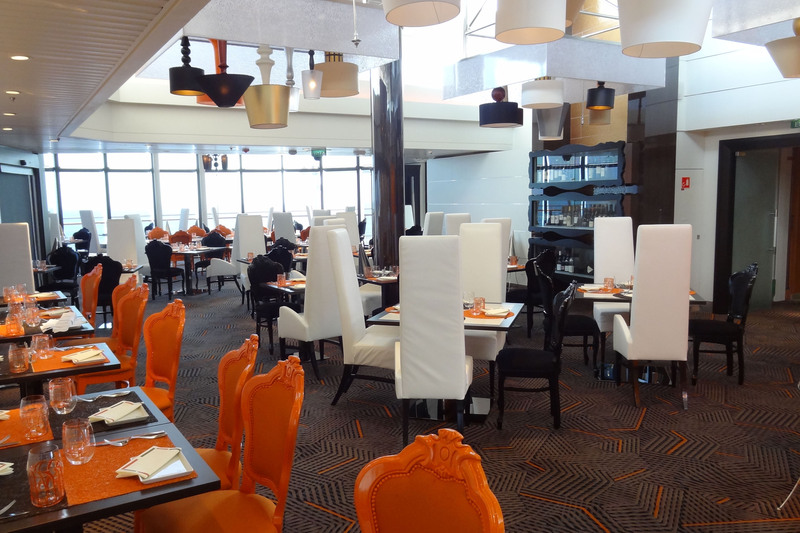 As we’ve discussed previously, the notion of specialty dining spaces on board cruise ships is not without its challenges, but it is also not without its rewards. Dinner for your group or just the two of you. Earlier this year we traveled from Puerto Rico through Bermuda and landed in New York aboard the Celebrity Summit. While on board, we had dinner in several of their specialty restaurants, but the one that rewarded us with the most original experience was Qsine. From the moment we walked into the space we felt a bit like Alice Through the Looking Glass. Surrounded by orange, white and black, we sat beneath a light fixture composed of multiple table lamps – all hung upside down. Then the server brought the menu. What fun! An iPad menu. This wasn’t the first time we’d ever been handed an iPad at a restaurant (it seems to be a bit of a fad for those that can afford it), but it was the first time that the menu had such interactive capabilities. We were charmed from the start. A bit like a tasting menu, the selections sounded interesting and different – just what you want when dining is more than simply eating, as it is for us. Then we had a bit of fun with the mixed drinks menu. The iPad allowed us to ‘mix’ the drinks by moving the offered ingredients into the glass on the screen, finishing with ice and then shaking! A great way to get to know your drinks! After a very entertaining run-down of the menu by the most enthusiastic and knowledgeable wait staff you could encounter anywhere (they seemed to be having as much fun as the rest of us), we chose a variety of their items all designed for sharing. Then the parade began. Chefs will always tell you that the presentation is as important as the dish itself, and it is true that we experience our food not only through taste and smell, but also through our visual sense. The staff at Qsine seems to have this down to a true art. We’ll leave some of the presentation as a mystery so that you too might experience this some time, but for those of you who might not, we‘ll highlight one particular presentation. 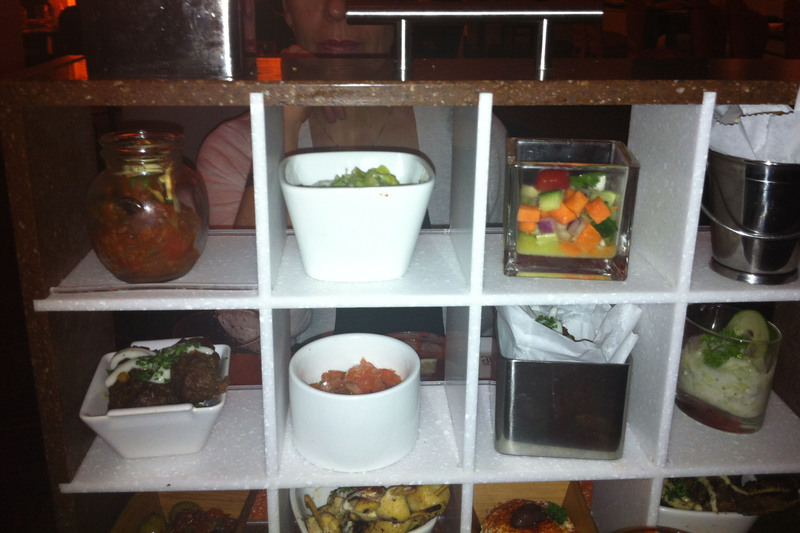 Have you ever had a dish served to you vertically rather than horizontally? 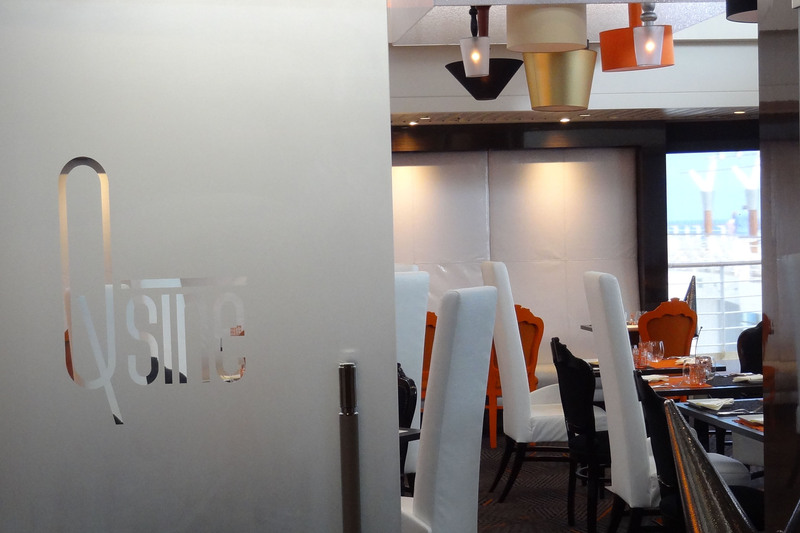 Didn’t think so – neither had we until we dined at Qsine. The vertical serving dish as Patty peeks through from the other side. When the waiter brought the course to the table, he placed something that resembled Patty’s Victorian dollhouse in between us on the table – but with the front wall missing. In each little cubby-hole resided a different tasting dish from the part of the world we’d chosen for that particular course. What fun it was to look, consider and sample the food. Oh, and about the food? It was one of the most satisfying dining experiences we’ve ever had. It occurred to us that if Celebrity wanted to franchise this concept on land, hip Torontonians and maybe even New Yorkers would flock to just such a spot. Maybe we’ll invest! The Celebrity ‘royal suite” living room & dining room. It all started as the grand experiment: the discerning travelers would return to the scene of their first cruise ship suite experience, and travel in a Royal Suite on a Celebrity cruise ship. We’re just back from that cruise and the verdict is in: the Royal Suite was not royal, and either we’ve changed, or Celebrity cruises has faced the recession by short-changing their highest paying per-person-per-day cruisers (we say that because the only suites larger are the two penthouses which seem to mostly be occupied by multiples whose cost-per-day can be kept down by sleeping on pull-out couches and sharing a bathroom!). The experiment needs a bit of background: after our first suite experience, we were convinced that this was the only way to travel, thus took another Celebrity cruise in the same category suite as well as two Regent cruises and one on Silversea. Both of these last two are billed as “six-star” luxury cruise lines and are all-suite accommodation (although the term suite covers a lot of ground). 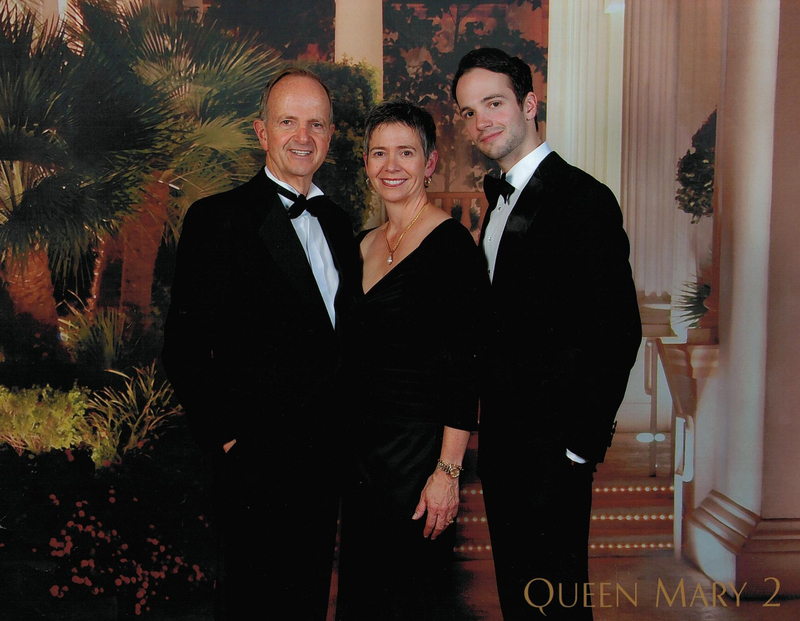 We also sailed aboard the Cunard Queen Mary 2 in a Queen’s Grill suite last year, a singular experience if ever there was one. We first need to say that we had a wonderful time on our vacation, the staff on the ship (especially in the dining room) adding considerably to that favorable experience. However, as the “suite experience” goes, it failed the test of discerning travel. When is a suite not a suite? When it lacks the suite experience. This was our third Celebrity Royal Suite experience. At just under 540 square feet with a living room, dining room, bathroom with double sink, Jacuzzi tub and stand-up shower, as well as a 195 square foot verandah, as cruise ship accommodations go, these should be luxurious. Well, that depends on how much you pay – and we paid a lot. Art – need we say more? 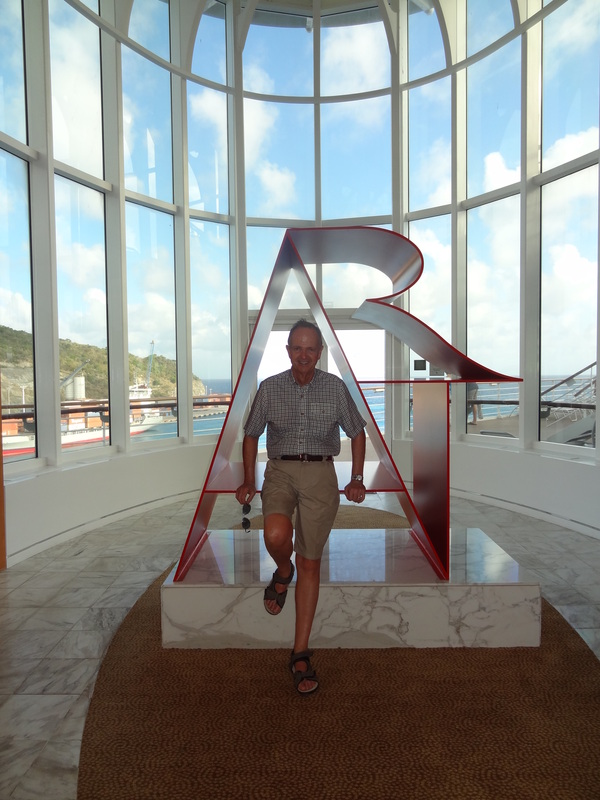 All of the suite experiences we had on luxury lines (Silversea and Regent, as well as the Queens Grill suite on Cunard) were terrific – but as anyone who knows anything about cruising recognizes, they are very expensive in relative terms. For example, aboard a Silversea ship for a comparable cruise in a comparable suite we paid almost double the cost of the Celebrity. Silversea is however, all inclusive, but does that justify the price? How much can you possibly drink in a week or two? At this stage, we think the Silversea price is justified. But you need the rest of the story. Then we were directed to get our keys from the maître d’ next door who informed us that as suite guests we could dine “for free” that evening in the specialty restaurant of our choice. We chose our restaurant and our time and were promptly told we could not be thus accommodated. So, we opted out. (Later, our butler was able to procure a reservation at one of them – and not our first choice – after considerable haggling as he told it). But specialty dining is another story. We boarded to find ourselves greeted by a tray of drinks and little else. (Oh, for the Cunard, Silversea or Regent greeting where they take your hand luggage and show you to you suite with a smile!). We found the staircase and made it to our suite on our own. When our butler found us, we were delighted to find that he was the same one we had had on the Celebrity Century almost five years ago in our first suite experience – so we expected to have exactly the same service. Well, things seem to have changed. First, there was the water. We asked to have the expected carafe of ice water alongside the ice bucket on the suite bar only to be told that Celebrity had discontinued that service. There was now a large bottle of water (for purchase) in the suite refrigerator. When asked why this had been done (other than the obvious money grab), he told us that it had been done for health reasons. What nonsense! What’s the difference between the stainless steel carafe of water and the stainless steel bucket of ice beside it? Or for that matter, the communal jug from which ice water is continually poured during dinner? And what about their “save the waves” environmental program? Bottled water? Which reminds us: there is no recycling bin in the suite. 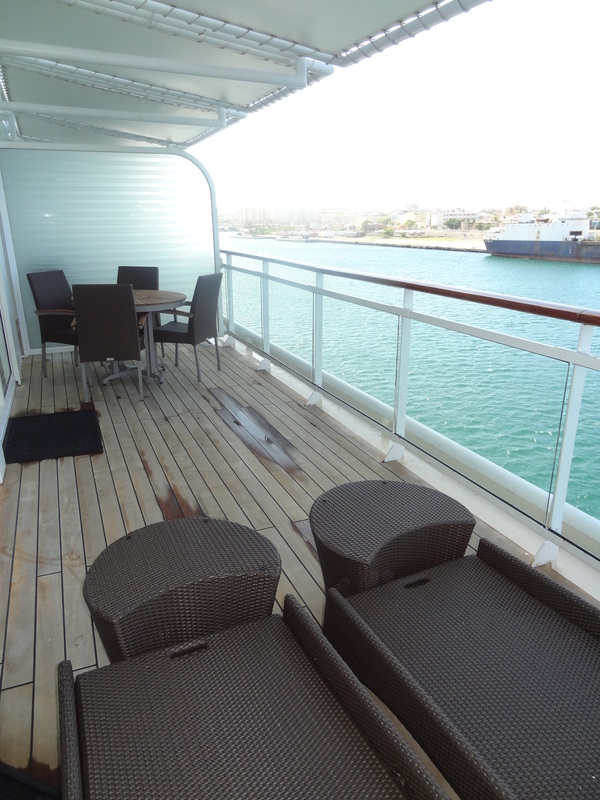 The cruise line web site indicates a number of impressive amenities in the suites. Frette linens, Bulgari bath products etc. However, a significant number of the expected (and listed amenities) failed to materialize: second hair dryer, slippers, “pillow menu”, reserved theater seating, tote bag (come on people, a flimsy grocery bag is not a tote), and our personal bug-bear – there was no luggage valet service (presumably on offer for everyone aboard). When we asked, we were told that it was in selected ports only – and we were further told that there was such an indication on the web site. With respect, we beg to differ, as this screen capture from their web site indicates. In any case, they did send us up a bottle of wine to compensate. Nice, but not what was on offer. We then went out to our verandah where we intended to spend a lot of time. But the cushions were missing from the lounge chairs. When asked, the butler informed us that the cruise line had removed them during the refit in January since they were considered (by someone) to be a fire hazard. So, for two days we sat on loungers that were designed to be topped with comfy cushions until we could stand it no longer. Guest relations promptly sent up the cabin attendant with cushions that are evidently now provided only on request. If we had not been in the same suite previously, we would not have known that they were missing: we would only have known that Celebrity had the most uncomfortable lounge chairs known to man. Evidently were not the first guests to complain either. The chaises in the foreground. No cushions? What were they thinking? There were two burned out light bulbs in the suite and one of the sinks in the bathroom lacked a stopper. Since these were not major inconveniences, we decided to see if anyone noticed during the eight days. No one did. It was often difficult to get service in a bar, and the debarkation process was chaos. Part of what sets the six-star cruise lines apart from others whose bread and butter is not their highest-paying customers is the attention to detail – details that you expect not to be overlooked. There were other parts of the cruise that now lead us to believe that the recession has taken a toll on service and amenities – but that’s a story for another post. 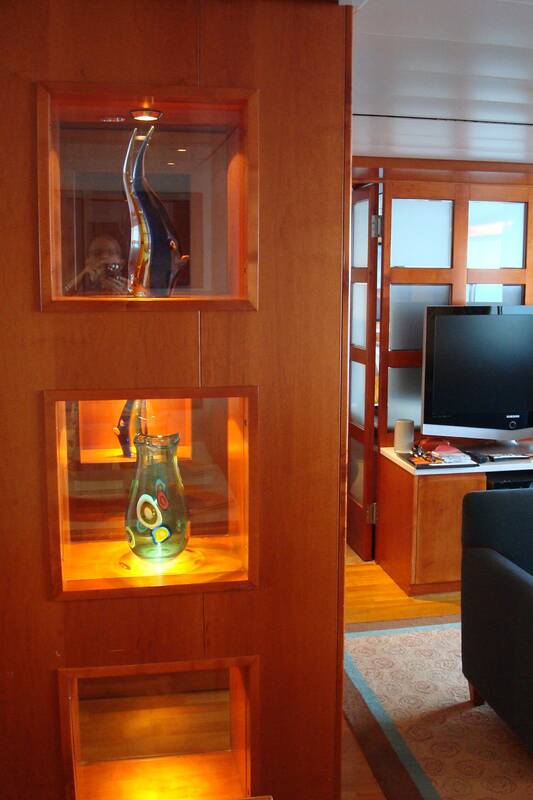 The bottom line is this for us: when seeking a six-star suite experience, cruise on a six-star ship. 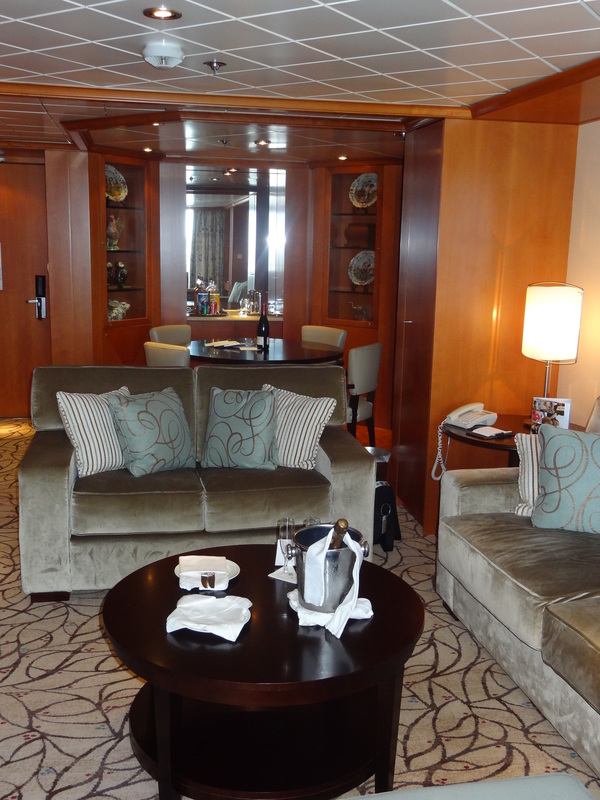 Suites on the other lines appear to be simply larger staterooms. Pity. The Celebrity Century: Welcome to our suite life! 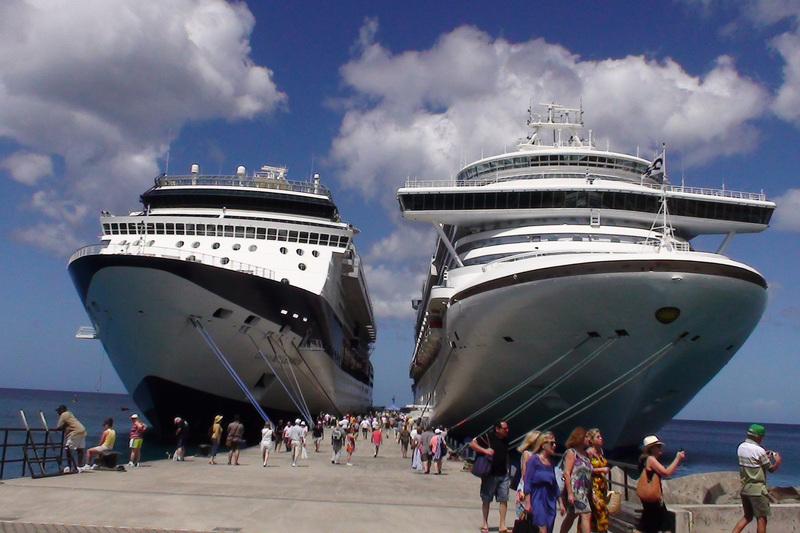 If you have taken even one cruise, it is likely (at least the statistics say so) that you will take another one. Oddly, when we asked out 22-year-old son a few months ago about his vacation preferences, even he said that his very favorite vacations were cruises. 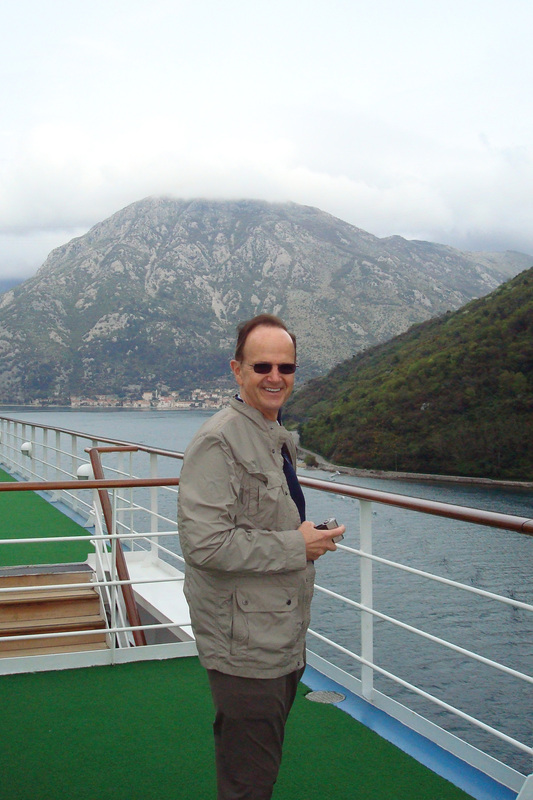 So, evidently cruises are not just for the boomer-and-beyond crowd! So, as you contemplate booking that next cruise – whether you’ve been on one or ten – with respect, please permit us to give you a wee piece of advice. If you are thinking of upgrading to a larger, nicer, better-located-and-with-more-amenities stateroom, consider the answer to this question before you do: Are you prepared to book this level of stateroom (or above) and pay the price for every cruise you will take in the future? If the answer is no, then step away from the upgrade. The fact is this: once you upgrade, you will never go back! We know this because on our 20th wedding anniversary five years ago we decided to book a Royal Suite on a Celebrity ship to travel the Mediterranean for the first time. Since then, we have been on half a dozen cruises and we have never been able to convince ourselves that we’d enjoy anything less. Ouch, that can be expensive – but oh how you will enjoy your cruise! From the perspective of the discerning traveler who is judicious about that luxury spending, it his worth every penny. In our opinion, as we’ve mentioned before, bigger is not better when it comes to cruise ships – unless you’re referring to your suite!